We had some excitement a couple of weeks ago when Mr. O finally lost his first tooth! It was then followed by tooth number two a few days later. He was very excited to finally have some teeth come out. Being one month shy of his ninth birthday, he’s been waiting a long time! The day that he lost his first tooth I made him this Tooth Fairy Tin. I made one for Mr. P when he lost his, and have been waiting to make Mr. O his. 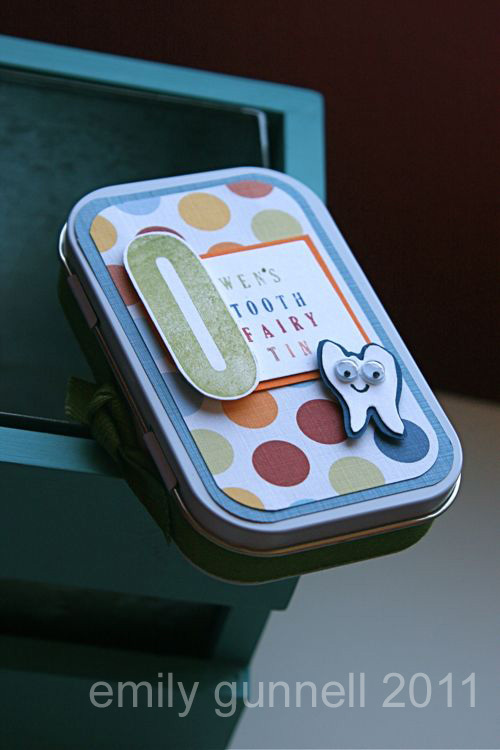 I have a small stash of these tins that are perfect for Tooth Fairy Tins. He was specific in wanting a tooth on his. So I free hand cut the simple tooth shape and backed in on coordinating cardstock to make it pop. The googlie eyes and smile were a must, if you ask me. 😉 For the rest of the stuff, I just went thru my scraps since I only needed a small amount of paper and cardstock to complete the project. The inside is lined with black felt, making it easy for the Tooth Fairy to find his tooth inside the tin! That is THE CUTEST idea ever!!! I’ve never seen or heard of that!! Super Cute and super fun that Mr. O is starting the fun process!!! Nice to get updates on the boys and your crafting skills. I am eating an jaw-breaker right now at work—if I break off an old tooth, may I have a Fairy box???? I know how deep my Fairy’s pockets are!! LOL Plus, I got dental insurance!! I’m so making this! I’ve been trying and trying to find a tooth fairy container, and I haven’t found ANYTHING I like. This is the most perfect idea! Thanks!